Two girls. The class of 4B on a skiing day. The snow. The blood, the shot to the heart. But the girls’ friendship yet blossoms: “our eyes shine right into each other”. They elope from the downhill ski slope and the teachers and go into the woods. The need for freedom, to get away and to dream big dreams. And the lust for fantasy, for play that unites the children, a gothic tale of horror and romance in Azharia, the kingdom of freedom. Arrow Valadon and Amelie Wilson flee Errit Semir, the village where the King of Darkness forces the women to hide their faces. 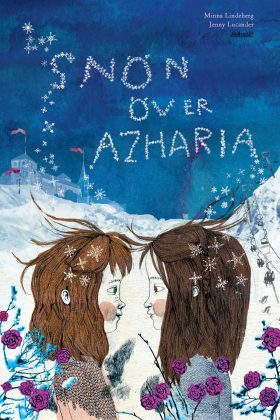 Snow over Azharia is an illustrated book about friendship, so strong and fragile that it might be love. Snön över Azharia är en berättelse där text och bild är alldeles superbt väl sammanfogade, rentav organiskt sammanväxta. Det är ett kraftprov i bildberättande!